Last week it was suggested I run the numbers on Rick Moranis. He's always been a favorite of mine and I decided this might be fun. The one problem I thought I might run into with Moranis wasn't quality so much as quantity. Turns out I was right on this. I don't think that's any reason not to run it mind you, I just figured since we're talking a short list, why not knock out the other Mckenzie brother while I was at it? Thus in the first double installment, We will also be taking a look at Dave Thomas. Quick reminder how this all works. I take all the films an actor or actress has been in and break them down into three categories, 'Good' 'Bad' and 'Ok.' I do not count TV appearances or Made for TV movies. Afterwards a quick analysis will show whether or not they're a good actor by the numbers. Invariably there is a 2-3 +/- point bias on a person to person basis. Also since ok movies are not bad they count towards the positive column. Is this a fair test to do with them? Sort of. You might want to argue that Dave Thomas has always been more of a TV actor. You might want to contend that SCTV should be factored in. While I agree these contribute to the over all standing as entertainers, SCTV is sketch comedy. All you have to do is look at the long list of failed acting careers by sketch comedians to bear that out. What? Don't judge me, that was a good movie. 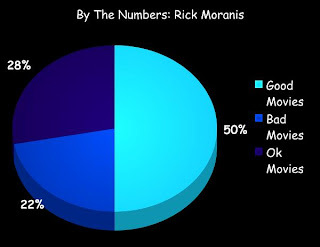 Final tallies stand: Rick Moranis (through technicality of short list) is a Fantastic Actor with a whopping 78% good over 22% bad. 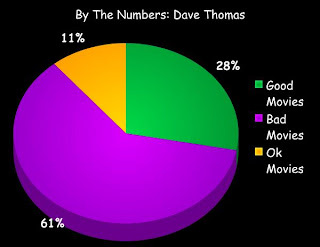 Dave on the other hand is an Abysmal Actor at a shameful 61% bad over 39% good. Too funny! When my husband's drunk, he sometimes watches this! Our friends gave it to him as a b'day gift. He's obsessed with beer and brews his own! I'd love to see a Strange Brew or Follow That Bird II! Strange Brew pwns! I f'n love that movie...always have and always will. I used to watch the old SCTV re-runs on my local PBS station when I was younger and instantly became a Doug and Bib fan.